Why The HydroFloss Is The Best Oral Irrigator And Why You Want This One In Particular. If you are watching this video you should be on this page right here, where it says Toothy Grin Store and the Hydro Floss Oral Irrigator. If you’re not, there’s a link underneath the video that you can click on and that will bring you to this page. So I want to talk about the Hydro Floss Oral Irrigator, obviously. Why is this device special? And I will say--I will make the statement--that I believe that every family, every family should have one of these Hydro Floss units. The reason why is that dental professionals tell us that approximately 75% of people have gum disease. Now why is that important to you? That number 75% means 75 out of 100 it also means three out of every four people. Three out of every four. So what are the chances that someone in your family has this problem or needs help in this area but just doesn’t know it? Now how do you know? How do you know if you have gum problems or not? Do you just go and have someone look at your mouth and you go by their opinion? You see periodontal disease, as dental professionals say, affects 75% of three out of every four people. The problem is, people don’t know they have it. So what’s an objective way for you to know if you have periodontal a.k.a gum disease or not? That’s very easy. There is an objective measure. Most dental professionals will believe or feel that if your periodontal pocket depths are 3mm and below then your gums are relatively healthy. If they’re above 3mm then they consider them to be, perhaps, not quite as healthy. So, who does these measurements for you? Well, your hygienist. When you go to get your teeth cleaned, you ask the hygienist to do it. They should be doing it anyway, it’s part of their job, but it’s not always being done so ask them and then you will know are your pocket depths 3mm and below or do you have some fours, and fives, and maybe some sixes or even beyond that and you just didn’t know about it. If you find out you do then you know you’ve got to do something. Now where does the Hydro Floss come in in this equation? It’s very simple. I’m going to tell you my story. What happened to me is that my gums would bleed during dental cleanings for years, and all they told me was ‘You have a little problem’. Well what does that mean? They didn’t tell me I had gum disease until one day the problem got bad enough that they said ‘You need a deep cleaning or a scaling or root planing treatment’. It’s the same thing-- deep cleaning, scaling and root planing. I didn’t like the sounds of that, and you know what else... It’s expensive. It costs a good pretty penny to get those treatments done and insurance doesn’t really always pay for all of it. So you have to think about the expense of it and also the long term effects. I went out, I said no to that treatment, I went out and I found the Hydro Floss and I used it. And after several months, I went back and the dentist and the hygienist they stared and stared and they looked at my mouth, and finally the dentist said, ‘Whatever you’re doing. Keep it up. You don’t need that treatment anymore.’ Score one for the good guys. Now, why can’t you use a regular irrigator or any other kind of irrigator? The reason why is that Hydro Floss has a patented, magnetic, technology and that magnet causes the plaque and the bacteria to become less adhesive to your teeth and therefore they come off much easier. Studies in a peer review journal have shown that the Hydro Floss has reduced much more plaque and tartar buildup between office visits than irrigators that don’t use this technology. So now do you see why I think everybody, every family, should have one of these units? That’s the reason why. This is Dave Snape, Toothy Grin Store, signing out. Bye bye. Wanted to add a few more things to this video. One, I want to state that everything I just said was said in general. 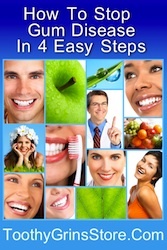 If you have a specific question about your dental health that should of course be directed to your dentist or doctor. I also want to mention that the story I just told you--I have had the privilege of talking to many people about their use of the Hydro Floss and I am hearing similar stories from other people. In other words, I am not the only one who got these results. Many people have. And I would say that the vast majority of people that I talk to are getting these results. Of course, every human body is different, we have different chemistry, we have a different makeup, so the results can’t be guaranteed 100% of the time, but I can tell you that many many people besides me that I’ve talked to have experienced this reduction in pocket depth. And I’ll also add that those pocket depth measurements are your objective way to know if you have made improvement or not, because you can go into your next dental visit and find out if you’ve made an improvement. So you take a baseline, and then whatever you’re doing at home is what you are measuring--technically, or you know basically speaking--and when you go back, if those pocket depths have reduced, then you know you have made forward progress. And that is the real, objective way to know if you’re headed in the right direction or not. Also when you check out from Toothy Grin Store from this product, you’ll also get links in your receipt to download two books that I’ve written. One is called ‘What You Should Know About Gum Disease’--and that’s a rather large book, it’s about 240 pages--but the other is shorter, it’s called ‘How to Stop Gum Disease in Four Easy Steps’. You’ll also be able to read that book. These are books that are for sale on the internet in other locations. You can find them but you can also get them for free when you purchase a Hydro Floss from Toothy Grin Store and the links come in your email receipt. So, again, this is Dave Snape. Again, everything I said is said in general and if you have specific questions about your dental health, those should be directed to your doctor or dentist. And this is Dave Snape from Toothy Grin Store. If you have any questions you can see the phone number at the top of the screen, you can feel free to call me, I’ll be glad to answer your questions as best I can. Toothy Grin Store, this is Dave Snape, signing out. Thank you very much. * This information and opinions were provided in general terms only. If you have a specific question about your unique dental health situation, be sure to ask your doctor for answers to those questions. I am very pro dentist. It is important to get your teeth cleaned and checked on a regular basis.